We at Loony Literature headed up to Hull Truck Theatre last week to see the RSC perform The Famous Victories of Henry V – this is a play, for kids, that brings together all the exciting moments of three plays – Henry IV parts I and II and Henry V.
Basically, we need more of this – it is that simple. 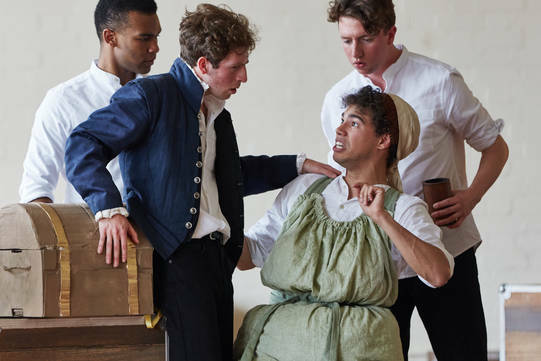 We have mentioned before that some teenagers can spend more than three years getting a GSCE grade C in English Language which includes a Shakespeare play. This is because they study it for two years at school but if do not get a C or above, they have to do it again. We have also said to anyone who will listen that kids need to be introduced in a fun manner to Shakespeare in primary school not in secondary school. By the time they study a play at secondary school they need to be relaxed about The Bard. The Famous Victories of Henry V by the RSC was everything and more than we could have wished for. Simon Yadoo as Sir John Falstaff in The Famous Victories of Henry V. Photo by Richard Lakos. 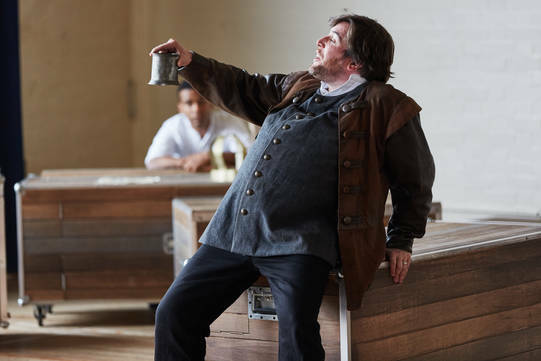 The cast was made up of young actors apart from the extra talented Simon Yadoo who played Falstaff/Henry V. The energy of the players was electric as the young actors went among the audience before the play started making sure that they knew what the plot was. The name of the game at this event was audience participation – those actors worked that audience as if they were back in Elizabethan England. There were props handed out to some of the children and they had to give them to certain characters during the play. The audience were taught a song about Falstaff’s wine which everyone sang with vigour while waving their arms about. This was obviously a winner as a group of girls sang it loudly in the lavatory after the performance. A young boy of about eight sat behind us and he had to stand up and shout. He was truly earnest and we were certain that that little boy would never forget that moment all his life. His eyes showed that. The RSC have also taken this production into some schools and we need more of this for our country’s children. Shakespeare is meant to be performed; this is the second item that we need for kids. We need them to experience crafted actors, like Martin Bassindale who played Henry V, bringing the characters to life. We want them to laugh until their sides ache like they did at this production when Mistress Quickly, played by Daniel Abbott, shook his bosom at them. Dale Mathurin as John, Martin Bassindale as Prince Hall, Daniel Abbott as Mistress Quickly and Nicholas Gerard-Martin as Dericke in The Famous Victories of Henry V. Photo by Richard Lakos. When kids have experienced this they will begin to understand what the Bard is all about. One teacher said that before the RSC visited their school, they used to have the ‘collective groan’ when Shakespeare was mentioned but now there was excitement in the air. Schools need to go to more theatre trips and more theatre companies need to be working with them, hand in hand. We don’t only want the kids of our country being introduced to Shakespeare in this manner, we want them to see Frankenstein making his monster and Dr Jekyll transforming into Mr Hyde. As with everything, a major problem is budget. We are not experts on these matters but surely putting money into the problem when kids are in primary school would balance out all those English GSCEs that teenagers are resitting around the country. We are talking hundreds of thousands of resits here, not a mere few. We have a world famous literary heritage and it is only when we make our kids proud of it will the level of GCSE resits drop.